Someone sent me an email recently, encouraging participation in a climate rally. "Speak for the Climate" was the subject of the email, and it really got to me. But it took me a moment or two to realize why. The climate does not need anyone speaking on its behalf. It is not a living thing. It is not suffering. Even if it were alive, however, I'm sure it would be an extrovert, and an assertive one at that! No, the climate does not need anybody speaking for it. The children, on the other hand, need many advocates. The children of all species are, for the most part, voiceless and powerless in this struggle to safeguard the planet and their future. Two ideas for giving young people a voice have come my way recently. 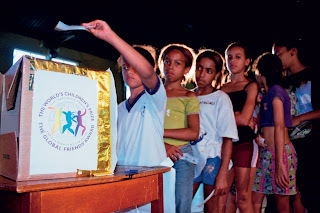 The first is that we should allow adolescents to vote. The obvious reason these days is that the older a voter is, the less he or she cares (or seems to care) about the future. So the people whose lives we are threatening most by not taking strong action to get to zero carbon emissions are the people who have no say and cannot participate politically. "I say, allow them [children] the right to vote at birth, but give that right to the parents until the child turns the age of majority. Variation 1: make your vote proportional to your remaining life expectancy. To make it easy, consider the normal life span to be 100. Infants get 100 votes, 100-year olds, get 1 vote." Kind of a cool idea (even if I did find it at Halfbakery.com). The second reason to give teenagers the vote, as explained by a friend recently, is that young people are still passionate and apt to vote for the Earth. The older we get and the more responsibilities we take on, she said, the more we vote for our own security — mainly financial security, putting the Earth much lower on our list of priorities. The second idea is to create a children's ombudsman, voted in by young people in each jurisdiction. This position would be held by a youth and yet be considered a senior level portfolio. Kind of like having a kid looking over your shoulder every time you make a decision, reminding you to keep the children in mind. This reminds me of something Raffi (the Canadian children's singer) proposed around the beginning of this century: child honouring. It's not unlike the concept of intergenerational equity, a principle of sustainable development. Raffi developed a Covenant for Honouring Children, which is a beautiful document. According to the Centre for Child Honouring website, "Child Honouring is a philosophy—a vision, an organizing principle, and a way of life—the children-first way of sustainability." In any case, we all should be speaking for and thinking of the children, of all species, in every decision we make that might affect the Earth and the future. Many recent government led studies have found that climate change and its associated impacts presents a high likelihood of future global wars. I am confident that in the face of a discreet enemy, that our brothers and sisters and our sons and daughters will put their lives on the line to protect our freedom. In the face of the true nebulous enemy of climate change that will be behind these wars, which is already claiming 300,000 people a year, we are not willing to put our lives on the line, or even a modest decrease of our creature comforts. With the freedom earned by those who sacrificed their lives comes great responsibility. The personal and political choices that we make freely come at a price. It is our choice whether that price includes only past world wars, or futures ones as well. With that I propose a toast, let us not forget the dead and the dying. Maybe people would have more compassion for children if they thought their actions would lead to their children being sent to war, comapared to a more nebulous threat? I posted this morning on the latest from James Hansen (http://www.grinzo.com/energy/index.php/2009/11/09/james-hansen-speaks/), in which he mentions intergenerational responsibility. Lou, thanks so much for keeping me informed on what James Hansen is up to. He's one of my foremost climate heroes, for sure. And thanks for your continued efforts to help people see that climate change is a huge threat to our children, to all the children. Remi, your toast is thought-provoking and - once thought about and understood - heartwrenching. Why is our species (or, at least, our culture) so willing to throw our youngsters' lives/futures away? Makes us kind of like gerbils, eh? Pretty unthinking and unfeeling. I would be fascinated to hear how your toast is received. Appreciation and thanks to you both, gentlemen and like-hearted souls.